I've been building up my modular system & studio for about a year, and many of the parts (Moog Mother-32, Arturia Minibrute & Microbrute) feature sequencers that can be clocked to each other, which is great. However this module allows me to use them at different rates while remaining synchronised which has opened up a whole world of experimentation. The outputs can be used to sync other units, to set the tempo of tapped LFOs on modules such as Mutable Instruments Peaks and the Disting Mk 3. I like the usual Doepfer high build quality and the fact that you can switch between the three modes; a straight clock divider with 7 divided outputs (half speed, quarter speed and so on), as a set of prime numbers to create poly rhythmic beats and a set of sequenced outputs. Each output has it's own LED so you can see at a glance what is happening - it's a very slim unit so might not be suited to the edge of a case as this could hinder access to the sockets. Like all the other Doepfer modules I have purchased from Thomann it comes well packaged and came with two screws and a connecting lead for the bus board. Highly recommended if linking sequencers is your thing! I got this new Deeper clock divider to add to my arsenal of clock dividers and multipliers - you can never have enough clocks! This is a really sweet addition for anyone who wants to add complexity to their clock system in the euro-rack, since not only does it produce the 'standard' 2,4,8,16 divisions it also goes up to 32, 64 and 128. But if that wasn't enough, it offers prime number divisions, which can make for crazy off beat timings at 2, 3, 5, 7, 11 and 13.... not enough? Then it also does a straight count from 2 all the way up to 8. 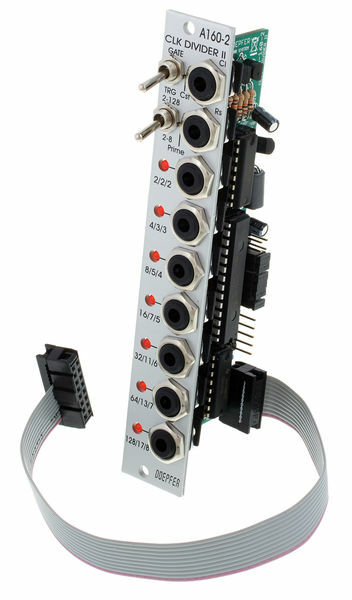 The module is switchable to produce triggers or gate outputs too. All this in a tiny 4hp of rack space. Build quality is to the usual high standard offered by Dopfer; nice switches and smooth sockets. I have this sat next to a 4ms rotating clock divider and they compliment each other wonderfully. All in all a brilliant module for a great price. Doepfer rocks around the clock again! ID: 364116 © 1996–2019 Thomann GmbH Thomann loves you, because you rock!